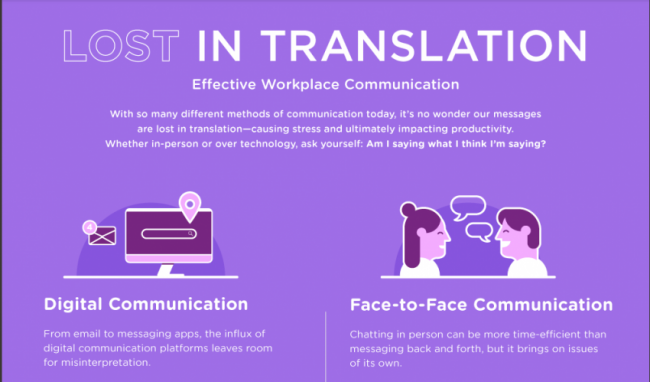 Communication in the workplace has always posed a challenge, but 21st century trends may mean even more misunderstandings. As the US becomes more diverse, so do American workplaces, and that increases the likelihood of cultural and cross-gender misunderstandings. Moreover, many businesses now have workers spread out in different states and countries. The technology has changed, too. Email and similar digital communication has largely supplanted face-to-face meetings. But we all know that our messages are often misinterpreted, even when we take our time writing them. In short, regardless of whether you’re communicating in writing or face-to-face, there’s always the risk of misunderstanding or even causing offense. There are steps we can take that ensure our messages aren’t lost in translation. Check out this infographic to understand more about why having effective workplace communication matters, and how to best accomplish it.